We get a fabulous surprise package twice a year. It's almost 6 months before we can show it off. That's a long time to keep that secret! But the cat is out of the bag now! My "Bearly Tracks" with Vintage Morris! 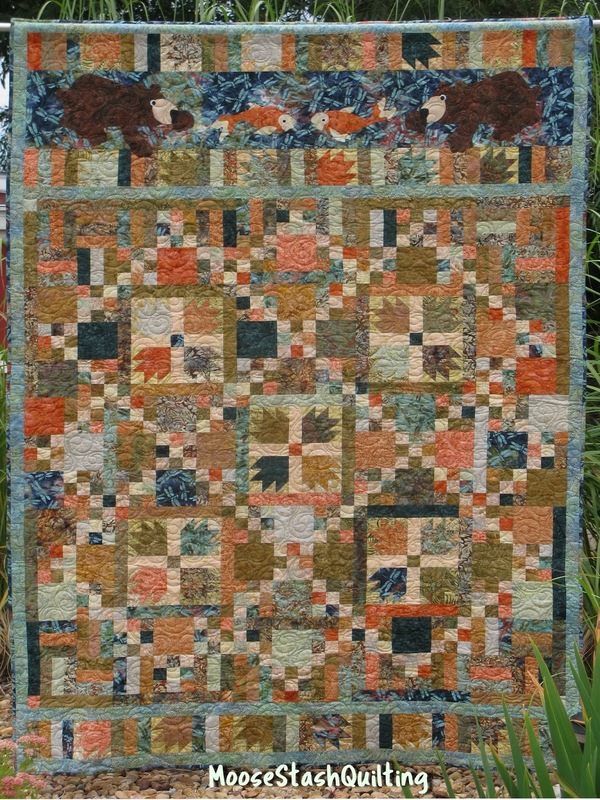 This quilt, is a combination of 2 patterns, that were in my huge stack of things to do. Anyone else have those issues? This pattern is perfect to show off the incredible depth, these "Vintage Morris" fabrics have. giving it just the whimsy needed, to bring it all together. I just love the addition of these adorable little bears and fish. Just look at how beautiful, these fabrics are. What better place for a photo shoot, than the ole car pond. I'm sure my fish were quaking in the pond, at the thought of those bears lurking above! for providing the fabrics for this project. That one of the incredible perks, of being an ambassador. The other big one is being able to share with you. How about a give away? In the process of combining patterns, I've cut these 5" squares that I didn't use. I'd love for "1" of you, to win them. Rafflecopter didn't play nice, I'm so sorry about that. My internet and phone service has been up and down. It's likely going to be next week before it's resolved. Leave me a comment telling me what project you would like them for. I will pick my winner next Friday August 17th. let me know in your comment, please. One last look at "Bearly Tracks". I just couldn't resist showing off my beautiful hibiscus plants. but they sure were beautiful. We've got a month of fabulous to share. Joan, it is a beautiful quilt! The colors of the Vintage Morris collection is perfect for this one, you did a great job! Great way to combine two patterns. And the fabrics are a delight. You are so creative with your designs. And how lovely to see it out in your garden which is looking great especially as it is in the middle of Summer! Your bears are adorable. 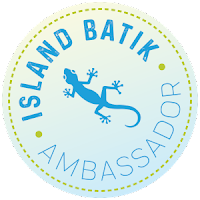 I love Island Batiks and seem to include them in most of the things I make. These colors are perfect for an autumn table runner. Joan, this quilt is absolutely adorable! I love those bears! That is one gorgeous quilt. Brilliant to combine the 2 patterns. Fabulous colors and lovely design! I love your fabrics and would love to make a table runner from them. That is really wonderful. The colors are fabulous, as well as the design. Love your photo shoot at the car pond too. I have a few fall runners to make and would use them for that. Love your project! I would be excited to use the fabrics in a quilt for my sister in Alaska. Oh my, what a pretty quilt. I love the combination of large and small "chained"sections. Beautifully done, Joan! I love your quilt. I would put your squares with some of mine and make a lap quilt for donation. Your quilt fits the theme perfectly! 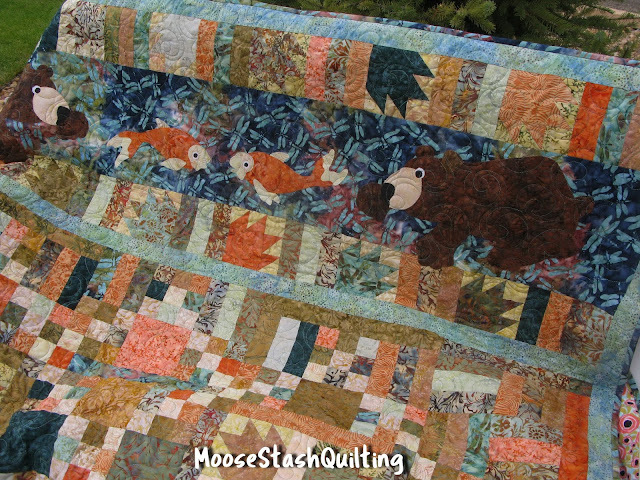 I love bear paw quilts, and this one is extra awesome! Good job! A lovely quilt and story, and those fantastic surroundings to take photos. I love this time of the year when we can take our quilts outside. Winter time gives us dark days, especially here in Norway. I have been making quilts this year but those squares make me think it's time to make a tote again! Joan, your quilt is so cute and the fabrics are perfect for it. I think these are my favorite so far. Thanks for the giveaway. These would definitely go into a quilt. I love that you combined a couple of patterns. Makes the quilt really unique. I would maybe make a wall hanging or a quilt from these squares. Your quilt turned out great! The squares would work up into some fun patchwork placemats. Thanks for sharing the great giveaway! I love that quilt. The fabric is just right for that design. I have in mind an art quilt I want to design, and those squares would be perfect for it. What a beautiful quilt! Love the colors! I’d love to make something for my sister who loves dragonflies, maybe a runner, wall mini or a zippered bag. That quilt is beautiful, the colors are gorgeous!!! I would make a quilt or wall hanging. Almost every year some branch of the family makes the trek to Yellowstone to visit us. I make them some kind of quilted piece as a memory of their time here. This collection reminds me of a Montana late summer, perfect for a throw. 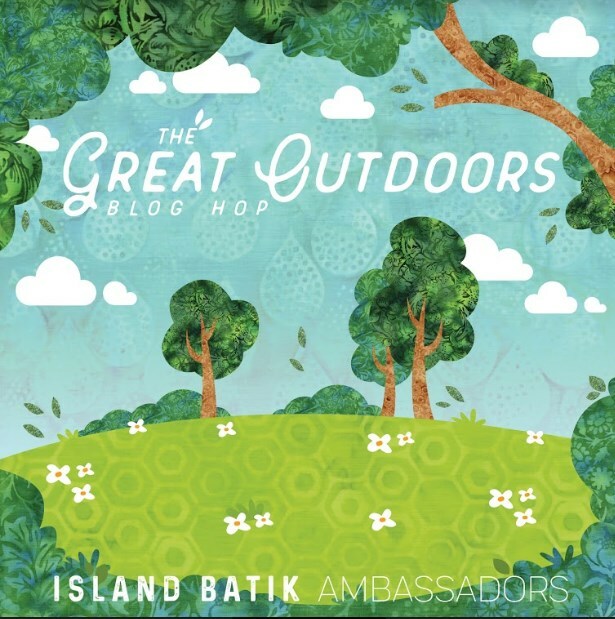 Your quilt is beautiful, and so very outdoorsy! I have a girlfriend who loves dragonflys, so I would use the squares to make a table topper for her. I love the way you combined those two patterns to make your quilt. Your quilt is gorgeous, love the designs you combined! I’d love to make a table runner with those squares! That is a gorgeous quilt, Joan! 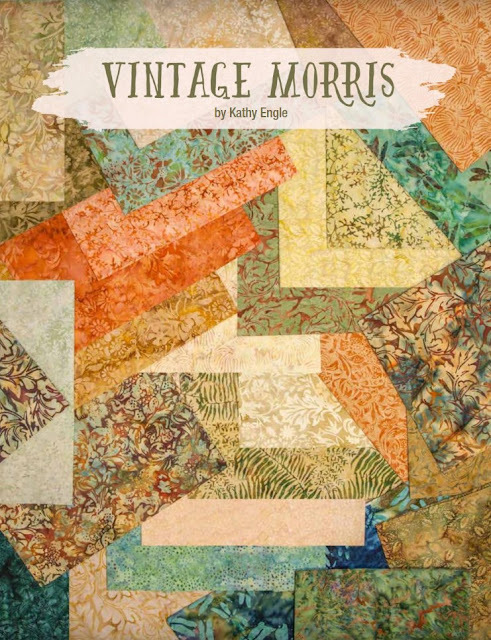 I love how you combined the two patterns, and of course, the colors in that Vintage Morris line are awesome. Perfect for a lovely fall quilt. And, a perfect setting in which to photograph. 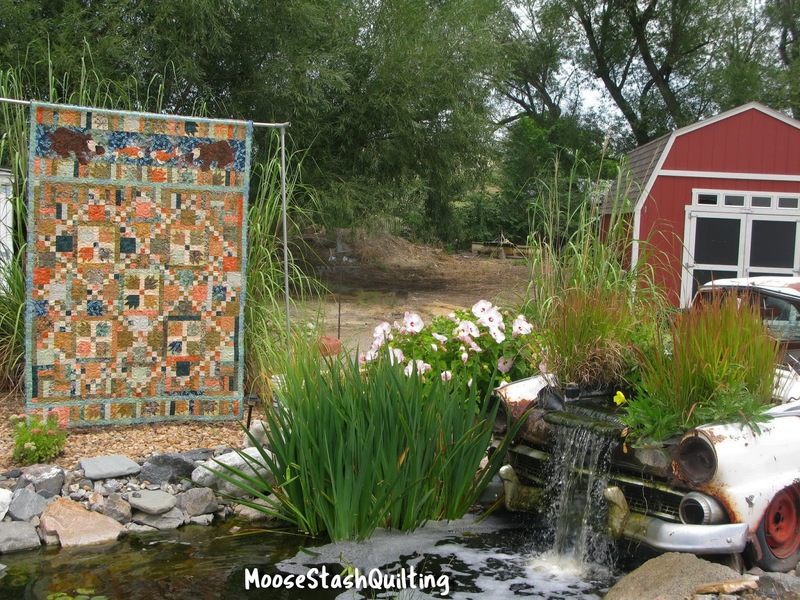 Love your yard as well as your quilts! !I am thinking I would use those as a table runner or wall hanging! I wasn't able to get into the Rafflecopter either. There was nothing to click, so I am guessing just a comment on the blog will put us in the drawing. Thanks for the opportunity to win! Your quilt is beautiful. I would use the squares to make either a small quilt or placemats for my son and daughter-in-law. I am sure they would love them in their new place. I love the bear and fish at the top of this quilt! SO much fun! I think these squares would make great placemats. I think I would use them for a bag to gift to my sister. I think killing two birds with one stone is the way to go!! I have collected so many patterns only to find that time flies faster than my sewing fingers. Great quilt. I'm collecting charm patterns to do a presentation for my quilt group and having some charm squares to make samples would be a real boon. Thank you for the opportunity. Good luck with the technology. What a fun quilt. It's perfect for these fabrics. And I love those two salmon trying to evade the bears! I loved your post! The quilt is beautiful and fun, and so is your garden. The car pond is absolutely delightful! Thhanks so much for sharing this. I would use the squares is a scrappy batik quilt. Beautiful colors and I love the bears. Island Batik blog hops are always so much fun with lot of inspirations. I don't have a specific project in mind but I love batiks and use them in tons of 9 patch squares and HST quilts. Love your pond! What a gorgeous quilt! Thanks. I believe a lap quilt would be great! Wow, I am just crazy about your quilt! So, so gorgeous! 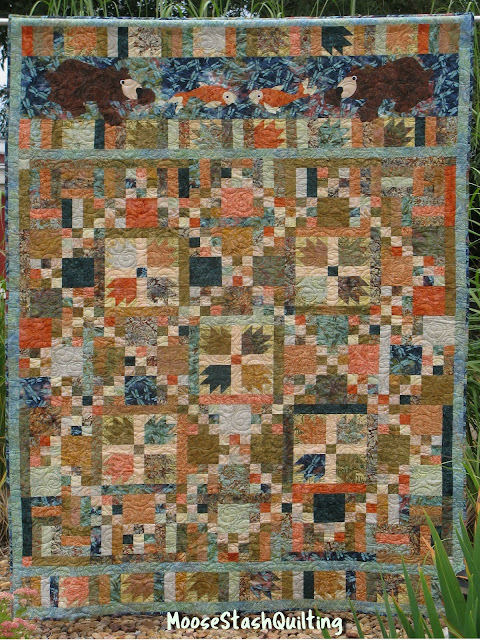 I think quilts that combine piecing and applique are just fabulous and your applique is always just fantastic. Those fabrics would look wonderful as a table runner. The colors would match perfectly. I love your quilt! I have a thing for bears! The first thing I thought of when reading your post was doing a bear paw throw! It's a pattern I've been wanting to try. Your car pond is just the best setting for quilts. The quilt looks fabulous...love it! Love the pic of it with the old car pond! I really like all the Morris fabrics I've ever seen, and having them in batiks would be such a great bonus! I'm going to have to look for these on my trip next month. If I were fortunate enough to win the 5" squares, it would be a start on the rectangles quilt I want to make from Successful Scrap Quilts from Simple Rectangles. Thanks for the chance to win. I've got some placemats that need to be made for a gift. These would be perfect. Thanks for a chance. Just catching up on my blog visits. 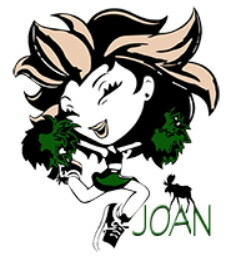 Joan, this is so wonderful! I love your Bear's Paw blocks and that applique! Just perfect.